Are you the type of person who asks for two olives in your martini? Do you make cookies, just so you can eat the dough? Request extra jalapenos on your nachos? Cherries, fudge, sprinkles and whipped cream on your sundae? A side of ranch to go with your fries? Bacon bits on your maple bar? Do you think more really is, well, more? If the answer is yes, then you my friend are going to love this. It’s a big, warm dish of ooey-gooey, browned-on-top-so-you-know-it’s-legit, cheesy fondue vegetables. 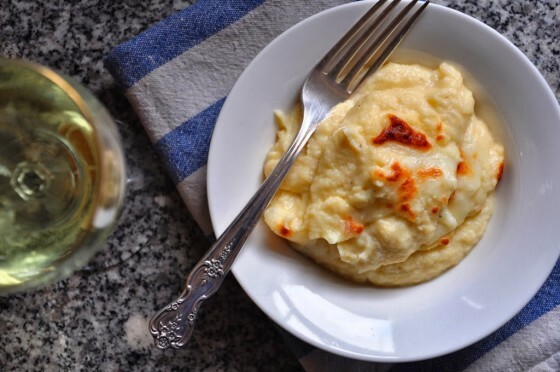 No, not vegetables to dip in fondue (cuz that would be sooo 1964), but fondue-sauced and gratinéed cauliflower and rutabaga puree. It’s got all the classic flavors of cheese fondue: white wine, a splash of kirsch, a hint of garlic, and rich, nutty gruyère. No skewering tidbits of bread and slender vegetables, none of that politely waiting your turn to dip business. 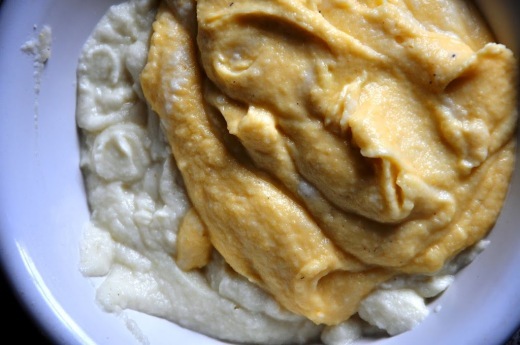 This is real deal comfort food, ready to be scooped into a bowl and lapped up with a spoon. Or for the more refined among us, to be served alongside simple roast chicken and a hearty green salad. 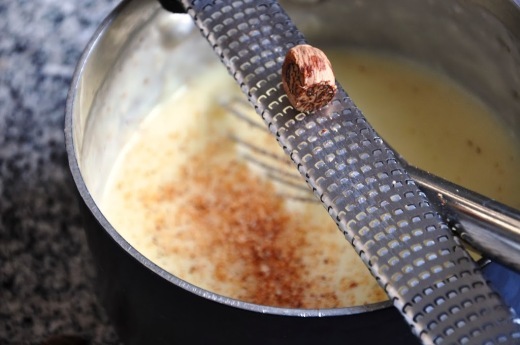 I’m not trying to knock traditional fondue, I’m just saying there’s a time (après ski, fancy date) and a place (Swiss chalet, next to the fireplace) to mess with sternos and special pots, fancy long-handled forks and emulsified cheese. And it ain’t always that time. 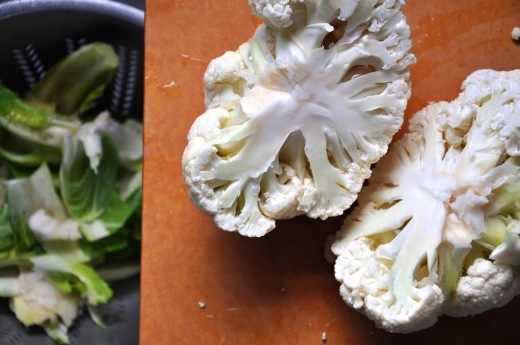 Sometimes you have a head of cauliflower and a couple of rutabagas rolling around in the produce bin, a nub of cheese, a bit of wine leftover from the weekend. And while it would make lovely fare for a romantic Valentine’s Day soiree, it would fit just as easily into a cozy, Netflix/Bates Motel marathon for one. And you deserve fondue, because fondue. 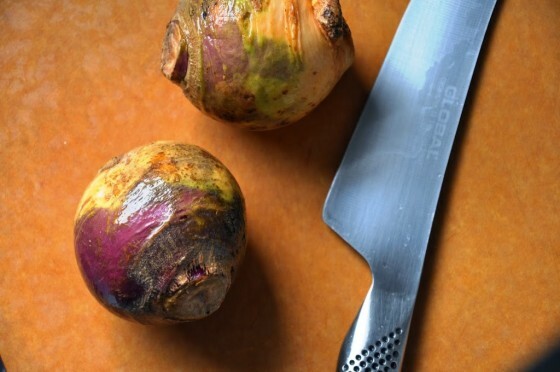 If you’ve never had rutabagas before, this is most definitely how you should get acquainted; the cruciferous edge is complemented by the nutty cheese and white wine (as are most things in life). The puree can be made up to three days in advance of serving, then broiled just prior to serving. If you choose this method, warm up the puree on the stove top before transferring it to a casserole, sprinkling with cheese and broiling to ensure the middle is hot and gooey! Melt the butter in a medium saucepot over medium heat. Add the cornstarch and garlic, whisking to combine. Slowly pour in the wine, kirsch (if using) and milk (or stock), whisking constantly. 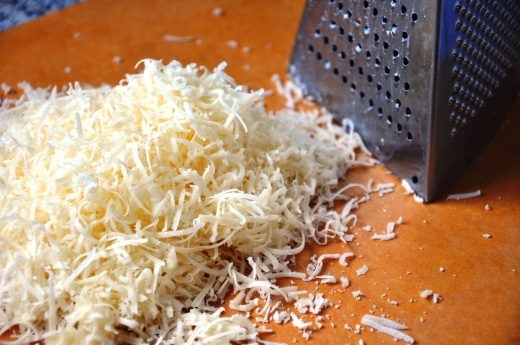 Then sprinkle in 1 cup of the grated cheese and continue to whisk until melted into the sauce. Cover and set aside to keep warm. 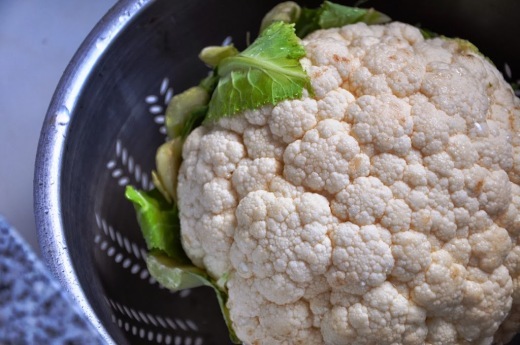 Chop the cauliflowerinto½-inch pieces and place in a steamer basket over ½-inch boiling water. 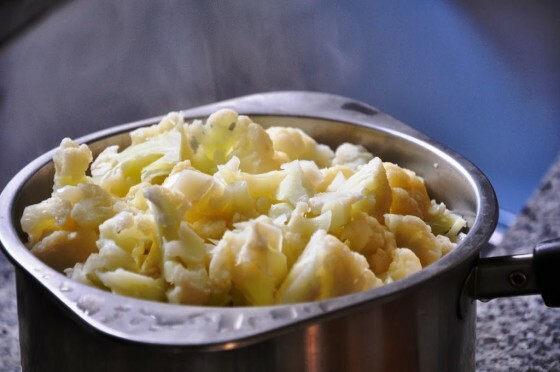 Cover and steam for 10 minutes until tender, then dump into a Vitamix blender or food processor. 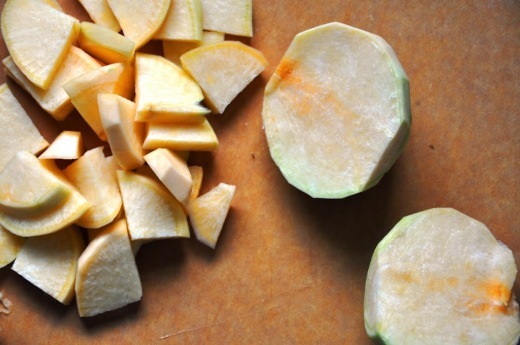 Cut the rutabaga into ¼-inch slices and put in the steamer for 10-13 minutes, until tender; set aside. Pour half the cheesesauce onto the cauliflower and puree until smooth; remove to a bowl. Repeat with the rutabaga and remaining sauce. Fold the two purees together and taste, adjusting the seasoning with more salt, pepper, cayenne and/or nutmeg as desired. 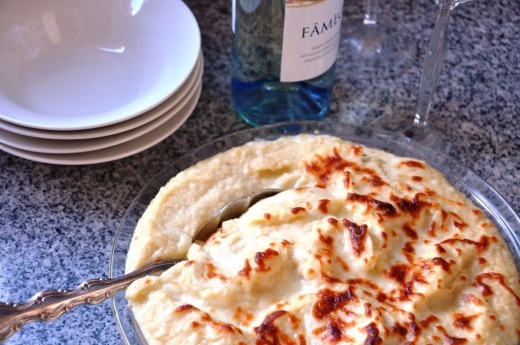 Scoop the puree into a casserole dish and sprinkle with the remaining cheese. 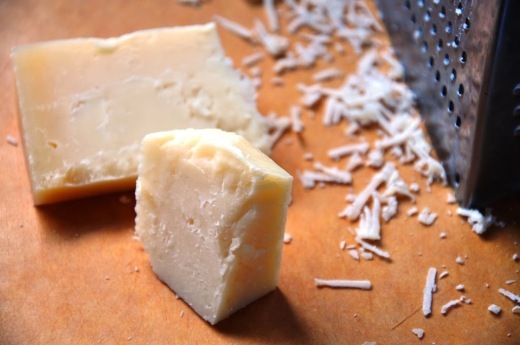 Broil for 3-5 minutes, until hot, bubbly and the cheese on top is brown. Serve immediately.